It can be a little disconcerting to interview Mike, Mark, and Nick LaRosa at one of their namesake restaurants. They’re constantly scoping out the reception area, eyeing employees, and peeking at what customers are ordering. You wonder if they hear your questions. But they can’t help themselves. Mike (left) and Mark (right) with their father, Buddy. As competition increases and the company expands—there are now 64 LaRosa’s restaurants in four states—the focus on hospitality actually narrows, Mike says. “We’re trying to know our guests better so we can serve them better.” Technology is key to making more smiles, but so is good old-fashioned customer service. LaRosa’s jumped on the tech bandwagon early, introducing a centralized call center in 1991 around its ubiquitous 347-1111 phone number. Today it’s called the Guest Service Center, and staff monitors the company’s social media channels when they’re not taking call-in orders. Even store design is adapting. 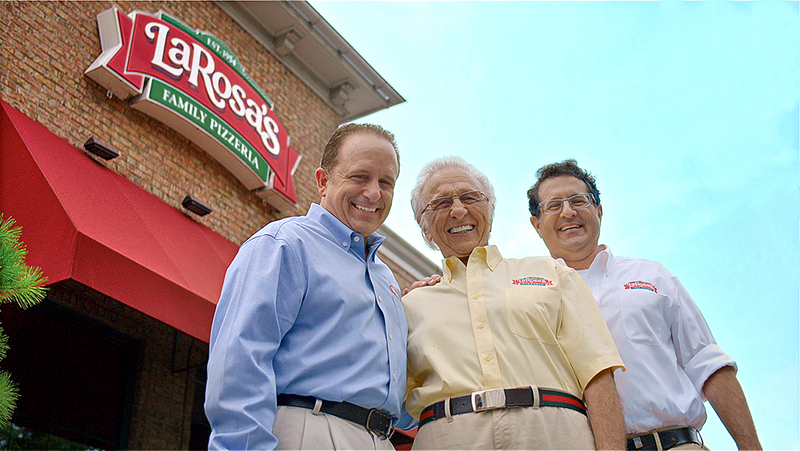 Chester Dadabo launched his pizzeria in Hamilton the same year Buddy LaRosa started his in Westwood. Six decades later, there remains only one Chester’s Pizzeria, though in a different Hamilton location, while LaRosa’s has expanded. Yet the Dadabo family’s impact in Butler County is impressive. 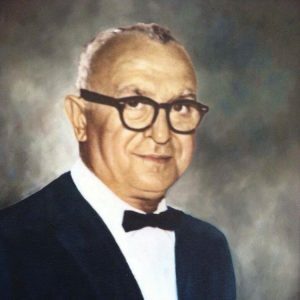 Chester and his wife Mary—both born in northern Italy—ran a Hamilton grocery store and bakery where pizza was popular; eventually they shifted full-time to pizza production. Their children and grandchildren grew up working at Chester’s Pizzeria, with son Nick taking over the business upon Mary’s death in 1996 (Chester died in 1979). Nick’s son Nicholas is now general manager. Two other grandchildren run their own pizza restaurants in the area: Raymond Leugers opened Raymond’s Pizza in Liberty Township in 2008, and Chuck Vitale started Pizzeria Vitale in Hamilton in 2013. For Vitale, the venture was a return to his roots. There isn’t a fourth generation learning the family business with Vitale, but his daughter, a graphic designer, helped create the restaurant’s web site and food truck graphics. He says he and his cousins, though competitors, help each other out when needed and respect each other’s businesses because they trace their passion back to the same source. 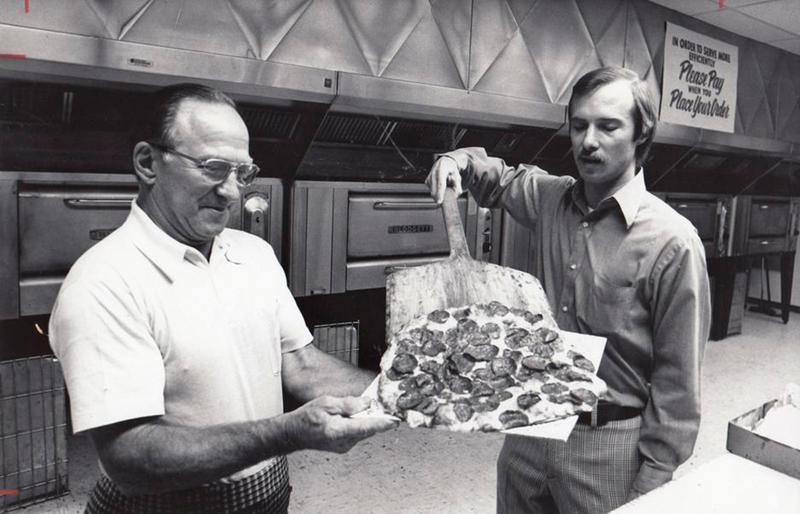 Back in 1965, when all of Dayton’s pizza places were carryout, Marion Glass, a franchise owner of three Cassano’s—the area’s most popular pizza chain at the time—had a vision for a pizzeria where you didn’t have to scarf down slices in the car or at home. He put in a bid on a lease for a roomy new franchise location that would seat hundreds. When word got out that he had beat out the “Pizza King” Vic Cassano Sr., who was bidding on the same location, he had only two options: give the space up to Vic or be dropped as a Cassano’s franchisee and go it alone. Roger Glass (right) with his father. Fifty-three years later, you can guess which option he chose. He dubbed the new venture Marion’s Piazza after Italy’s vast town squares where large crowds gathered for celebrations. Within three months, he was up and running, and during that time he worked with suppliers to finesse recipes that could hold their own. He approached Pillsbury to formulate a unique blend for the dough (for a flavorful, thin, crispy crust) and Stanislaus to concoct the perfect sauce (not too sweet, not too spicy). The results were so popular the recipe is the same today. “They’re the only ones with the secret ingredients—other than me, in the safe,” says Roger Glass, Marion’s son, who took over the business in 2006 after his father passed away at age 92.